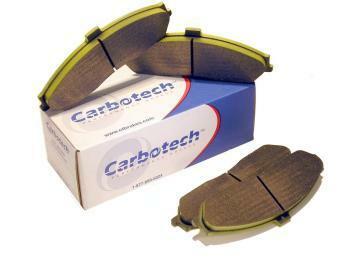 Carbotech XP20 Pads - Brakeswap.com - Friction for the Win! The latest iteration of the highly successful XP™ series of compounds. XP20™ is a step up from the highly successful XP16™ compound. With an extremely aggressive initial bite, the most linear torque curve to date and excellent fade resistance the XP20™ leads the highly successful XP™ series line of compounds from Carbotech™. XP20™ has a temperature range of 275°F to 2000°F+ (135°C to 1093°C+). Carbotech™ XP20™ maintains our tradition of having the outstanding release and modulation that has made all other Carbotech™ compounds so successful. The XP20™ as with other Carbotech™ compounds is very rotor friendly. Carbotech™ XP20™ is NOT recommended for use as a daily driven street pad due to possible elevated levels of dust and noise.